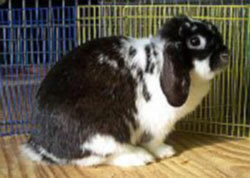 The ARBA Standard of Perfection lists the desired traits, faults, and disqualifications of each breed of rabbit. Breeders and judges use this book as a guide to select the best animals. 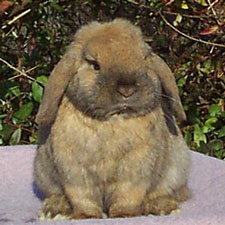 But some breeds list some faults as being bigger problems than others. 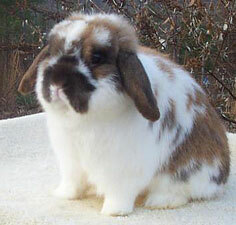 This article walks you through the severe faults in the Holland Lop breed. Not all faults are created equally. Some faults, while they are not desirable, are not the kiss of death. And, since there is no perfect Holland, they all have faults. We just have to decide which ones and how much we can tolerate in our breeding program. For many faults, it’s a matter of opinion. You set your own tolerance levels. But for other faults, the Standard of Perfection has given us more guidance. Those faults are noted as “cut severely” in the standard. Those are faults that we should not tolerate in our herds. These faults are bad enough that judges have been given specific instructions to knock off significant points for them. In my opinion, there is no way that a Holland with one of these faults should be competitive. So what are they? Let’s see. Items in bold are taken directly from the Standard. Cut severely for long or narrow body. This is very undesirable type. Very long and narrow body and head. I don’t see this one happening on the show table as much as I would like to. In fact, I’ve had some short, full-bodied rabbits placed low in the class lately for being “too wide.” And no, they aren’t flat and they didn’t get poor comments on shoulder width. A breeder not long ago showed me a doe she considers to be on the narrow side all of the way down her body, as did I. She’s puzzled about why this rabbit does well on the table. 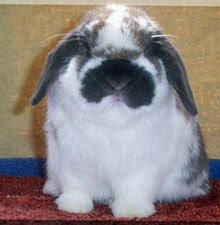 She notes that this rabbit’s shoulders are no wider than some other rabbits she has. But this one is never dinged for it while the others are. Instead, this rabbit should be cut severely for a narrow body, but isn’t. Even though the judges may not be catching narrowness or length, we should cull for that heavily in our barns. Yes, you might want to give a young rabbit some time to fill out, but a long rabbit will never shorten up. I do feel that rabbits tend to shorten with line breeding, so if you have some outstanding, but longish rabbits, you might want to try line breed them. But if they don’t shorten in a couple of generations, cull. Cut severely for narrow or long head. I think 90% of my herd was like this in the beginning. I had no curvature. There were no cheeks. There was no wide, even space between the eyes. But, the heads improved quickly, often with just one generation. Cut severely for long legs, narrow legs, or fine bone. This rabbit has fine bone. Look at how thin the front legs are. I am guilty of keeping some does with fine bone. I do breed them with heavier bone for better offspring. But I need to toughen up on that one in my barn. I have plenty of heavy bone, but I don’t need to dilute it with fine bone. The “long legs” fault gets me. There are far, far too many Hollands, in my opinion, that do well on the show table with long bone. And I’m sure there are rabbits in my herd that should be dinged more often for that as well. But until the rabbits with short, fat bone are moved up the table and the long legged ones are moved down, we’ll still see successful rabbits that should have been cut severely. Notice, the standard doesn’t say to cut severely long legs with fine bone. It says to cut severely for long legs – and that would include long legs with heavy bone. Sure, the long legs with fine bone should be cut doubly. Heck, they shouldn’t be on the table at all. I think where we get into the problem is that we confuse a high headset with a head high in the air at any cost. I’ve talked about this before, so some of you may be tired of hearing it. But long legs is not the way to get a high head. A deep, deep chest and the proper head-to-body connection location is what makes for a proper headset. 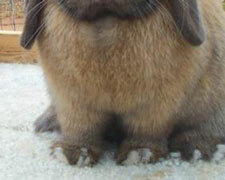 This Holland Lop has excellent bone. His front legs are like short thick stumps. You’ve seen them, I’m sure. These Hollands who have been taught to stretch up high on their long legs to get their head up. It’s awful. They make you think of a Britannia Petite, which is opposite to a Holland on almost every dimension. Cull those long-legged rabbits. Even cull those long-legged rabbits with heavy bone, or at least work your line toward the short-boned, heavy-boned rabbit. And I’ll worked on letting those finer-boned girls go. So that’s it then. The phrase “cut severely” is only mentioned three times (that I have found) in the standard for Holland lops. Do you notice what I notice? They all have to do with being long and narrow. Actually, I should say long and/or narrow. Sure, long and narrow is the worst, but narrow by itself should be cut as should length in body or bone. Think about the rabbits that you prize, admire, or lust after. Do they have round heads or narrow heads? Are their bodies round, short, and full or narrow throughout? Do you see short, fat bone on your favorite rabbits? Have we been overlooking some important parts of our standard? I think so. But we can’t look to judges to cull our breed for us. We need to do that ourselves. The new 2011-2015 Standard of Perfection for Holland Lops adds a fault for “weak ankles”. Some judges state that this is a very common problem, but what does it mean? This rabbit does have weak ankles. See how the foot sort of makes an angle as it hits the table, similar to the paw of a dog? 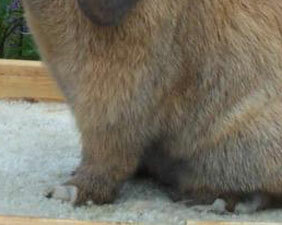 This rabbit does NOT have weak ankles. His feet hit the table like stumps. A front shot of weak ankles. A front shot of a rabbit with good bone.